By my count, in the last five years, 16 running backs have finished as a top-24 fantasy performer in their first year with a new team (not counting rookies). In that same span, 14 wide receivers have been top-24 finishers. A rough equivalent for a top-24 RB or WR is a top-12 tight end. Obviously that’s not perfect, but as a shorthand, it works. In the last five years, four tight ends have finished top-12 in fantasy production in their first year with a new team. That’s the whole list. Stretch it to top-24 finishers and the list grows — 16 total names in the last five years, including, for some reason, TEs 15-20 in 2015, inclusive — but there’s only so much value in identifying a back-end TE2 in fantasy. There are a few possible reasons for this. The first is a similar reason to why rookie tight ends often struggle — tight end is a complicated position, with several different tasks to learn, and in the case of many of them, the blocking part is the more important one. Another reason is the willingness of teams to move on. Running backs typically have short careers, and as such it often doesn’t make sense to pay them big money when contract extension time comes around. So teams are more likely to bail a year early on running backs, leading to guys who might be on the back half of their careers, but still have a year or two of relevant ability left. It’s how DeMarco Murray went RB1-RB2-RB1 in 2014-2016 with three different teams, and how the above-mentioned list of top-24 RBs features a lot of guys who soon went on to being backups. It’s not identical at wide receiver, but the list of receivers includes guys like Wes Welker and Steve Smith — on their last relevant stops before retirement — among its numbers. At tight end, the difficulty in integrating a new player, the paucity of big-name options, and the relative cheapness of a franchise tag makes it easier and more cost-beneficial for teams to keep guys around. So whereas teams bail a year early on running backs, they’re more likely to bail a year late on tight ends. It also means that, when a team does let a tight end go, it’s at least worth a few grains of salt and a deep dive into why he was allowed to move on. Heading into 2018, a larger number of tight end situations are in flux than we are used to, so it’s worth a minute to look at whether that list of top-12 finishers is going to grow by much this year. Below we’re looking at the guys who are most likely to lead their teams in TE production in their first year with a new team, and whether they could be TE1 finishers. Obviously, Graham was the inspiration here. He moved from Seattle to Green Bay this offseason, where he enters the season as our staff consensus No. 8 tight end, with individual rankings ranging from fifth to 10th. Coming off a 10-score year, where he was the No. 4 tight end in standard leagues and No. 7 in PPR, Graham still has plenty of appeal. Only … Graham’s 2017 season was buoyed by that scoring rate. His PFF grade of 54.2 was the lowest of his career by more than 22 points, and his 9.1 yards-per-reception average was also a career-low. His first year in Seattle, in 2015, was cut short by injury, but his per-game average would only have had him as a borderline top-12 TE, and he scored only twice in 11 games. 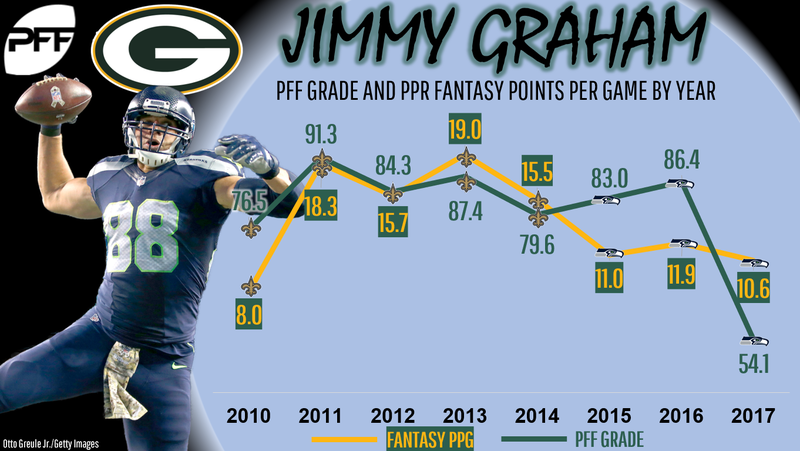 Graham’s upside is as high as any tight end outside of the current big three, but his floor is far lower than we’ve been led to believe in recent years. Assuming health for both Graham and his new quarterback Aaron Rodgers, he’s a safe bet to be a top-12 tight end, but probably not by as much as we’d guess based on name value. Burton is like the anti-Graham in this example — he is young (only 26) and is moving on more because his team didn’t need him than that he had gotten too expensive. With Zach Ertz in Philadelphia, the Eagles could afford to let Burton go, even if he had been plenty productive when Ertz was absent in 2017. Now in Chicago, Burton likely takes over the Zach Miller role, though Adam Shaheen and Dion Sims will have roles as well. Still, Burton is unanimously a top-12 tight end in our staff rankings, with rankings having him as high as eighth. He’s no safe bet to be a top-12 finisher, but he has a definite shot. Watson returns to New Orleans, site of his biggest fantasy triumph, after two years (one injured) with Baltimore. The Saints’ Coby Fleener experiment was largely a failure, with the current free agent totaling 928 yards from scrimmage and 6 touchdowns in his two New Orleans years. Watson, meanwhile, had 825 and 6 in his last year in New Orleans before leaving for Baltimore after 2015. That said, Watson is now 37. He played two games at that age at the end of 2017, and just those games have him borderline top-20 all-time for receiving yards at 37-plus years of age. Even 500 yards in 2018 would have Watson comfortably in the top-10 among players his age (all looking up, of course, at Jerry Rice, who somehow had 5,283 yards at 37 and older). Age catches up with everyone. Watson is our staff’s No. 22 tight end, and even if he exceeds expectations, it’s hard to picture him as a top-12 finisher. Marcedes Lewis, far more of a blocking tight end than a regular receiving option, finished 25th among tight ends in fantasy scoring in 2017. That was largely on the backs of his three-score Week 3, but still, if Lewis can be top-25, a tight end who is more of a receiving threat can be even more of a fantasy threat, given Blake Bortles’ difficulties throwing deep and the Jaguars’ lack of a sure thing at receiver. Seferian-Jenkins had 71 targets with the Jets in 2017, 15th in the league. With 357 yards, though, Seferian-Jenkins had the second-worst yards-per-target average (5.0) in the league, and he only scored three touchdowns. He’s our staff consensus No. 16 tight end, but that feels like close to his realistic ceiling. This one’s pretty straightforward. Ebron has been a top-10 fantasy tight end each of the last two years in Detroit, so obviously has that sort of potential, but playing alongside (and likely behind) Jack Doyle in Indianapolis, he’ll likely need an injury to Doyle to have a shot at a third-straight TE1 season. He’s the No. 21 tight end in our consensus rankings. This uninspiring group (combined 2017 line: 54 receptions for 861 yards and 6 touchdowns, 4 coming from Willson) are the most likely remaining candidates to lead their new teams in production. None comes in higher than 30th in our staff consensus rankings, and barring a big surprise, no, none of them will be helping the list of top-12 finishers grow.